Where did the word paparazzo come from? Though known and used the world over, no one is entirely sure. What is known is that it was first coined in a film, and not just any film: Federico Fellini’s iconic La Dolce Vita (1960). In the film Marcello Mastroianni plays a disenchanted tabloid reporter who skulks around Roman nightlife on the prowl for his next story. His partner in crime? A photographer called Paparazzo. Whatever it takes to get the shot, Paparazzo is there: hopping on the back of a Vespa, camera held high, hovering in a helicopter – what Fellini epitomised in his determined character was that the quest for the perfect image is paramount. 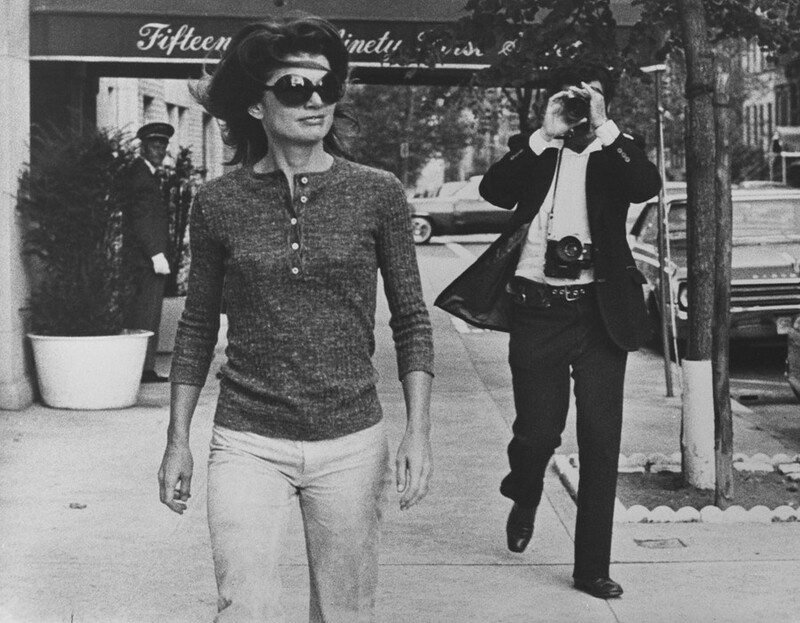 A new exhibition in Italy takes a closer look at the art of the paparazzi, the modern phenomenon we now consider a staple of celebrity life, and examines how the practice developed from its Italian roots. 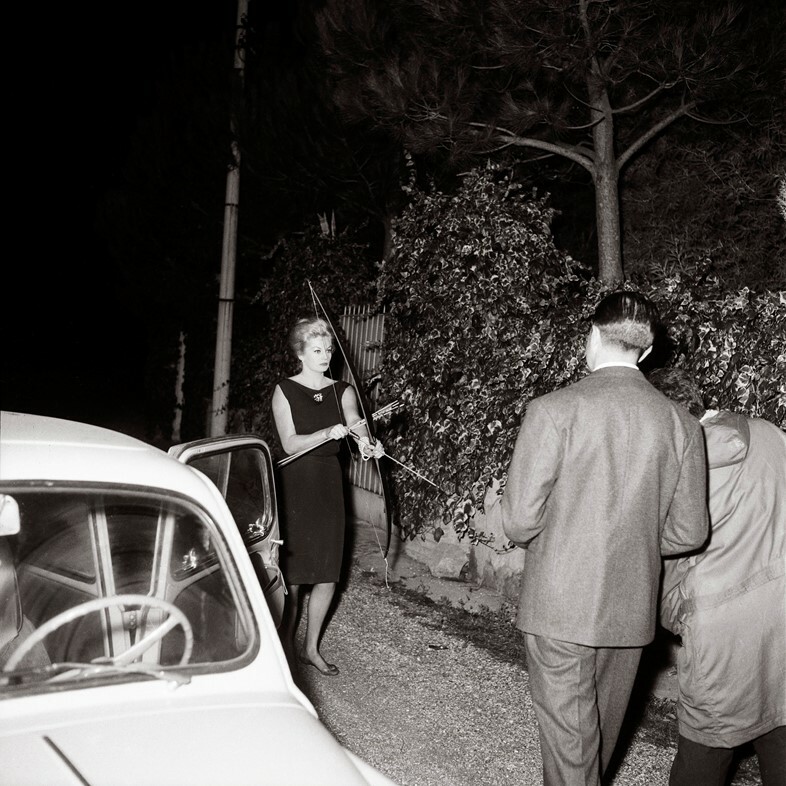 In the 1950s a group of press photographers began to target cinema stars on the streets of Rome. Key figures such as Tazio Secchiaroli, Marcello Geppetti, Elio Sori, Lino Nanni, and Ezio Vitale, began to work increasingly hard to catch unposed informal images of stars like Ava Gardner, Michelangelo Antonioni, and Sophia Loren. The show displays examples of every kind, from Brigitte Bardot leaving the Forum hotel in a short striped dress to Audrey Hepburn at the greengrocers while off-duty from filming Roman Holiday (1953). La Dolce Vita depicts the photographers swarming around the Roman streets with incredible accuracy, in all probability because Fellini himself was often a subject of their advances. In fact Fellini’s inspiration for Paparazzo was a photographer he knew well from the cafes in Via Veneto. 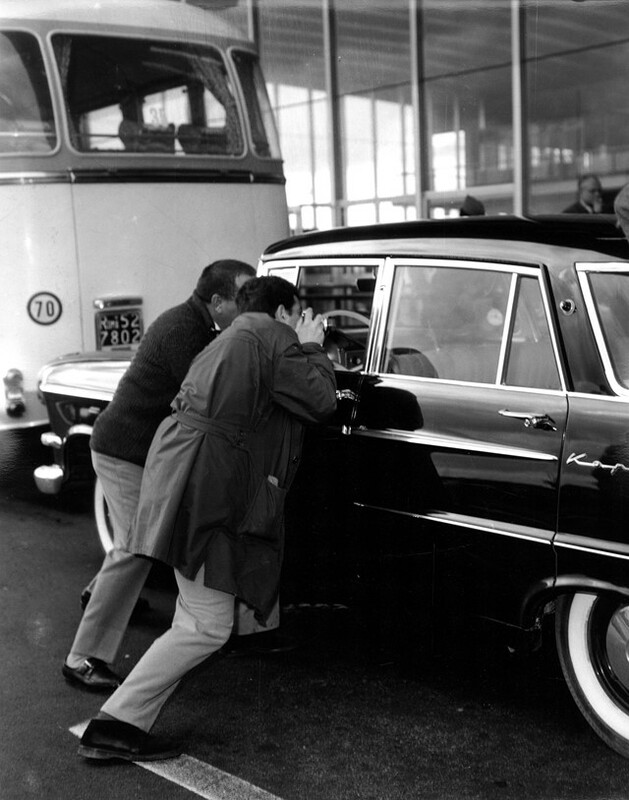 Felice Quinto, known as the “king of paparazzi”, was actually offered the role of Paparazzo by Fellini, but turned it down and opted to appear as an extra instead. In 1960 fact and fiction would collide when Anita Ekberg, the blonde screen siren playing Fellini’s paparazzi-hounded star, became a real-life target. Quinto snapped her kissing a married movie producer at a nightclub in Rome, and – a true paparazzo – didn’t stop there, but followed Ekberg back to her door in the early hours of the morning. He only stopped when Ekberg emerged from her home with a bow and arrow and shot him in the hand, an exchange that made headlines all on its own. Over time it was these secretive and increasingly scandalous images that made the front pages. The thrill of the chase was no longer enough, a scoop was needed to sell publications; to get the right picture was expensive business. Paparazzi photography became marked as a predatory practice, with aggressive intrusion in order to achieve the best shot practically a necessity. The concept of the paparazzi took on an identity in its own right, hordes of celebrity photographers that moved in packs and their unsuspecting celebrity subjects even became fodder for organised photoshoots. The exhibition includes Ellen von Unweth’s faux-paparazzi shots for Q magazine from 2003, an angry David Bowie lifting his hand to the camera, a mock-fearful Kate Moss clutching him to shield her from the lens. The artist Alison Jackson is also shown as an example of how the myth has gone even further, with her fake paparazzi shots constructing false realities about famous figures such as Marilyn Monroe and Princess Diana. Unfortunately in an age of fake news this kind of image manipulation no longer solely sits in the realm of artistic expression; it’s replacing the authentic images themselves. The days of La Dolce Vita may well be over, but as these images make clear, the exhilaration of their illicit beauty persists. Paparazzi runs at Palazzo Leoni Montanari, Vicenza, until February 3, 2019.